time to talk about the next things… – aRowe Films and Ent. I am lucky to not be so jaded by the form and structure of doing things the right way. I get to carve my own way and learn through the mistake of others as well of my own. Most aspect in my world of filmmaking has been just will and desire. If I want to do something I just make a plan and do it. I don’t get caught into the framework and processes that would be taught in a film school. I just research, find information, and make a choice to move the piece on the chess board. 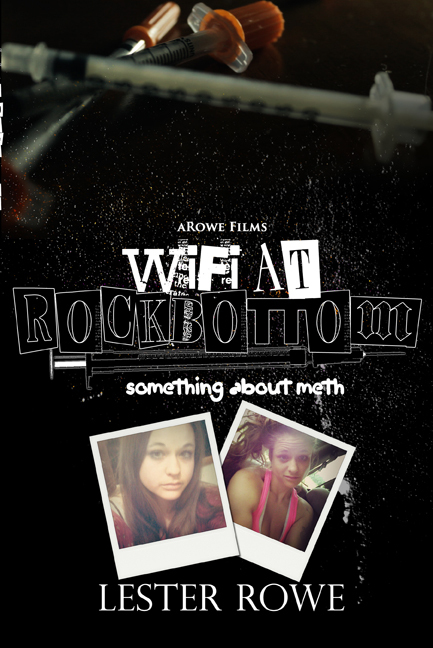 Wifi at Rock Bottom : Something About Meth took me on such a weird journey. I always felt like it was a ridiculous notion to think that someone came out with a movie or documentary or research paper from spending years with a subject. I never planned things to happen the way it did but this whole thing with Amancha and Wifi at Rock Bottom has been almost 3 years of …I don’t know … its been 3 years of something. This all came from wanted to make something that was 3 maybe 5 minutes of content and is now a short documentary and a book. Oh I guess I have never came right out and talked about the book on the blog..oops! I need to update more frequently in between the breaks. So the book will be available as an eBook and softback the week of April 20th through Amazon. I am thinking of doing something special with hard copys but unfortunately that will only be something limited to physical book stores. I will share more information once I have pre order information ready and hard dates. If you buy the physical book there will be a deep discount for the Kindle ebook version. So that was the technical stuff here is the grit: Wifi at Rock Bottom Something About Meth the book is every thing that lead to the documentary.It gives light to the mind of an addict in the moments of addiction. You will get to read private conversations between Amancha and myself. If you ever wanted to see the moment an addict became an addict this is the book for you. You will see how casual use turned into an addiction. The amazing thing about this book is that if you watch the doc and read the book you can find those points in the timeline and see what it was like in real time framed against how she retells it in the doc. I happen to get two very rare opportunities between the movie and the book. Alot more information to come! Being an “author” is just another path to carve and see how it goes. Glad I have you to take part of this journey with me.